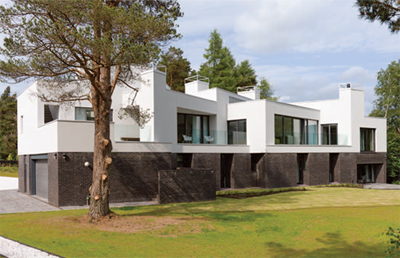 Designed by Hall McKnight Architects from Belfast, Gallery House sits within The Queen’s Crescent, an exclusive development on the edge of The Queen’s Golf Course in the grounds of the Gleneagles Hotel in Scotland. Sitting in the corner, overlooking the 14th tee, its plot is considered to be the best in the development. The dark and white exterior is striking from the outside, while inside the accommodation has been designed to let in as much natural light as possible, with upper levels housing lofty open spaces, and the ground floor houses the majority of the bedrooms. Four bedrooms and a generous living space comprise the ground level, while upstairs is an open plan sequence of spaces, including a living space, a dining room and a kitchen, with a further study in the gallery above. The internal area of the upper block is smaller than that below, allowing for a series of external terraces on this level; the master bedroom suite is also located upstairs, linked by terraces and a corridor but with its own private stairway. The grounds come to around 0.85 of an acre of mature, landscaped gardens, and the house has garaging and a hot tub. The Gleneagles Hotel is host to the 2014 Ryder Cup and has an international reputation as a great location for relaxation and golf; the hotel also has a shooting school, riding school, spa and a school of falconry. Gleneagles is within easy driving distance of Edinburgh and Glasgow, and locally the town of Aucherachter provides a good range of shops. Perth and Stirling are both within 20 miles. The guide price is £2.9m. For further information please contact Savills on 0131 247 3700 or visit www.savills.co.uk.